Residents of a Dorset village voted in favour of a national referendum on the European treaty in the country's first official poll on the subject. Villagers in East Stoke, near Wareham, decided by 90% that the nation should be surveyed on the new legislation. Only 80 of 333 on the electoral roll turned out - 72 voted yes and eight no. The vote was called when John Barnes, a supporter of the UK Independence Party (Ukip) used an obscure provision of the 1972 Local Government Act. It states that if 10 members of a parish call for a vote on any subject then the council is obliged to carry out the request. Thursday's vote was on the question: "Do you want a referendum on the EU Constitutional Treaty? Yes or No?". Mr Barnes said he hoped the result would lead to further polls being held across the country to put pressure on Prime Minister Gordon Brown to call a referendum on whether to accept the treaty. He said: "We have to send a strong message to the government that we want our say on the future of our country." Mr Barnes said he was pleased residents were willing to turn out to have their say despite the rain. "On the dot of 4pm, approximately 10 people went in to cast their vote and there was a great sense of camaraderie and joviality with high expectations about what this vote can achieve." One of the first residents to step through the doors of the polling station at the Dorset River Centre was Imre Niedermayer. The 60-year-old Hungarian-born landlord of the village pub, The Stokeford Inn, said he was happy to take the time to cast his vote as he believed the poll represented "democracy in action". "What this is about is democracy. I was brought up under communism and unless we have a vote about this treaty and unless we are all allowed to make our contribution to politics then it is not healthy and we will end up with a police state." 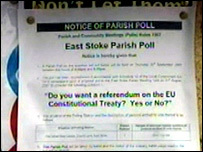 Simon Cross, chairman of East Stoke Parish Council, said the poll was little more than a publicity stunt. "The parish is being used to bring publicity to this politically-motivated procedure," he said. But the decision to hold the vote was welcomed by the Campaign Alliance for Referendums in Parishes (Carp), which is affiliated to UKIP and hopes other parishes across the country will follow suit. The next village to hold a vote is expected to be Lanteglos, near Fowey, Cornwall.